Distorted pieces of text are often used to prevent computers getting unauthorized access to websites. Now a team of computer scientists think they can do better with inkblot tests instead. The new approach is straightforward and relies on a user answering a number of questions when he or she first signs up for access to a website. 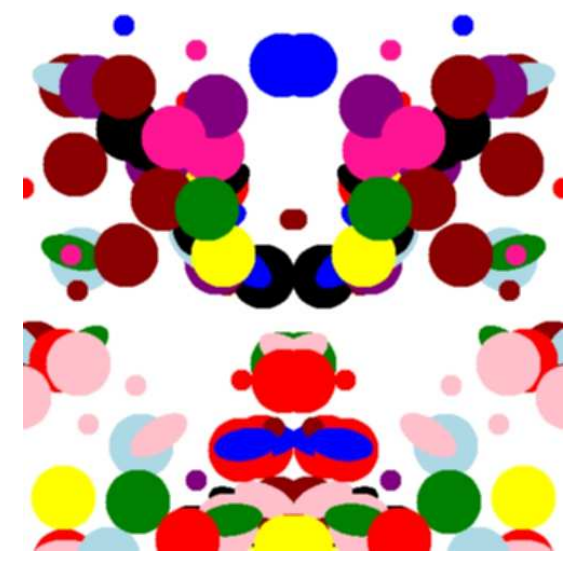 It begins by generating a set of simple inkblot pictures by randomly positioning different colored ink spots in a small area of the screen. Blocki and pals say this ought to foil an automated attack. “We argue that the adversary who wishes to mount a cost effective offline attack needs to obtain constant feedback from a human,” they say. That’s because only a human can consistently recognize the patterns and thereby link to the phrases on display -- at least that’s their hypothesis. That’s an interesting idea. The human ability to recognize patterns far outstrips anything that computers can do and matching this with the user’s interpretation of random patterns is clever. There is plenty of evidence that pattern recognition is easier than remembering passwords. To test this, Blocki and co. tested the idea using Amazon’s Mechanical Turk. They invited 70 Turkers to view a number of inkblot patterns and write identifying phrases, paying them $1 to complete the task. Then, 10 days later, they asked the same Turkers to re-associate their phrases with the inkblot patterns, again for a payment of $1. Blocki and co. say that the data indicates that a significant fraction of the population could use GOTCHAs. “It also means that the use of our GOTCHA would have to be voluntary so that users who have difficulty won’t get locked out of their accounts,” they add sheepishly. It’s possible that the tests with Turkers was not representative the way ordinary people would use GOTCHAs. For example, the Turkers may have rushed through the first phase of the tests to earn their money more quickly. View "Will GOTCHAs Replace CAPTCHAs?" and find more technology news from MIT Technology Review.